The other day, I saw a man riding his bike while texting. This, as you may know, takes some serious talent. Sure, driving while texting is pretty hard; you have to negotiate the steering wheel and your thumb, keep track of the road and a 1.5" square LCD screen, and brake and accelerate as needed, all at insanely fast speeds. But a bicycle? You've got to keep your legs moving, keep one hand on the handlebars, and try and focus on what you're reading/writing with one thumb, all while ensuring that a car (whose occupant is also texting) doesn't fly by and smoosh you. 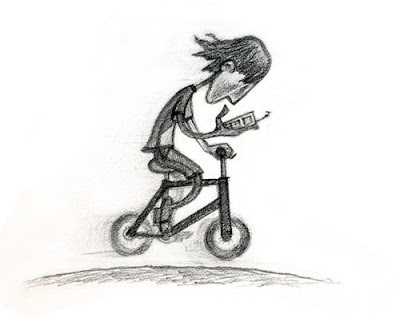 Forget all those tricks you used to do as a kid; try this one: "Look mom, I'm bicyctextling!" Okay, that illustration is HILARIOUS!! I hadn't seen it before. So great!